YORK – State Rep. Seth Grove (R-York) visited Glatfelter’s Spring Grove paper mill facility to celebrate Manufacturer’s Day in Pennsylvania. With a total economic impact of $79 billion annually, manufacturing is among one of the largest industries in Pennsylvania. Over 20,000 employers provide nearly 600,000 hard-working Pennsylvanians with a family-sustaining job. 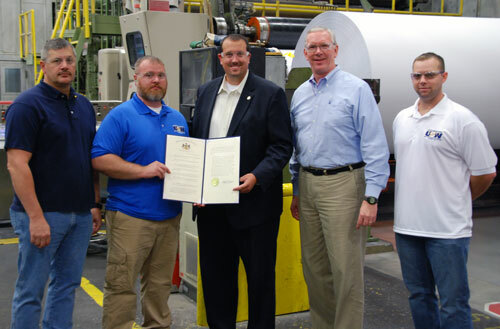 Rep. Seth Grove presents a copy of House Resolution 485, which designates Oct. 2 as Manufacturing Day in Pennsylvania, to employees of Glatfelter’s Spring Grove mill. From left to right, President United Steelworkers Local 1303 Jim Arnold, Chief Steward USW Local 1303 Rich Beish, Rep. Seth Grove, Mill Manager Robert Inners II and USW Local 1303 Vice President Ben Mook. Founded in 1864, Glatfelter employs over 4,600 people worldwide with corporate headquarters in York and a paper mill facility in Spring Grove.